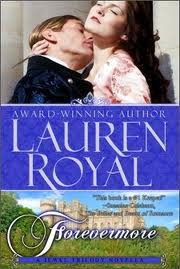 I've never read any book by Lauren Royal. This is the first one. Actually very nice one, very romantic. The way the author had portrait the characters, the platform. Overall, its a very nice read. M not a huge fan of romantic novels, but the one who loves it, must read this one. They met at his cousin's wedding where he's an honored guest and she's there because of the flimsiest connections. Clarice knows that her visit to Cainewood Castle is only a brief interlude from her normal life -- but she could not help but be dazzled by the ceremony, the dinner and dancing and the very young man paying attention to her. Cameron Leslie may be younger than Clarice but he knows what he feels for Clarice and wants to explore the attraction a little more -- if only Clarice would cooperate. In this novella, Lauren Royal explores the fine line between reality and fantasy -- Clarice is burdened by the former. She is painfully aware of her place in the world -- of her lack of connections and of the simplicity of her life. She is content with her lot in life but, Cameron's entry in her life is both a blessing and a curse to her -- Cameron represents everything that she can never have in her life -- a castle, a noble man and a chance at love. The contrast between her reality and fantasy is too broad and too painful for Clarice. ...Clarice was nearly thirty-two years old. Old enough to know she had no business lusting over a young man of any sort, let alone one dressed in the trappings of aristocracy. Her heart fluttered as it hadn't since her all-too-short youth. Evidently the fairytale hadn't ended yet. But it would, and then she would fall back to Earth, hurt again by a man. "You've the kindest heart, the sweetest soul. I wouldn't want you to behave any other way than you do already. And no matter what you say, we have quite a bit in common."